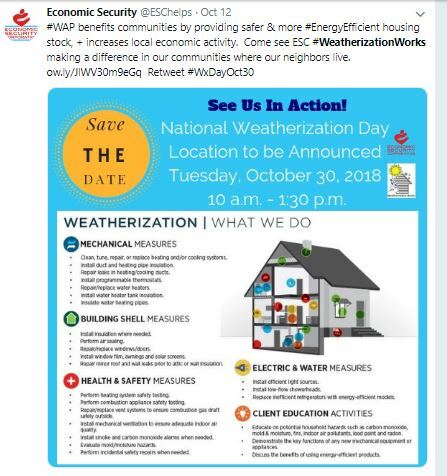 Below is a list of events, proclamations, press releases, news stories, and other actions surrounding the WAP 40th Anniversary, Energy Action Month, and Weatherization Day 2018. 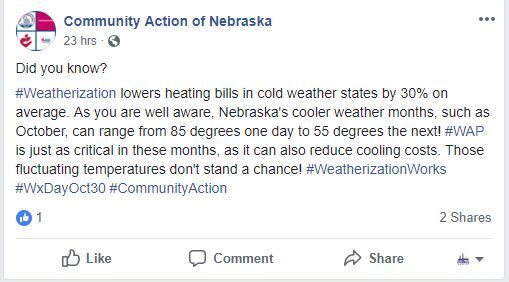 Governor’s Proclamations were issued in 13 states: Colorado, District of Columbia, Kansas, Kentucky, Louisiana, Massachusetts, Michigan, Minnesota, Missouri, North Dakota, Texas, Virginia, and Washington. 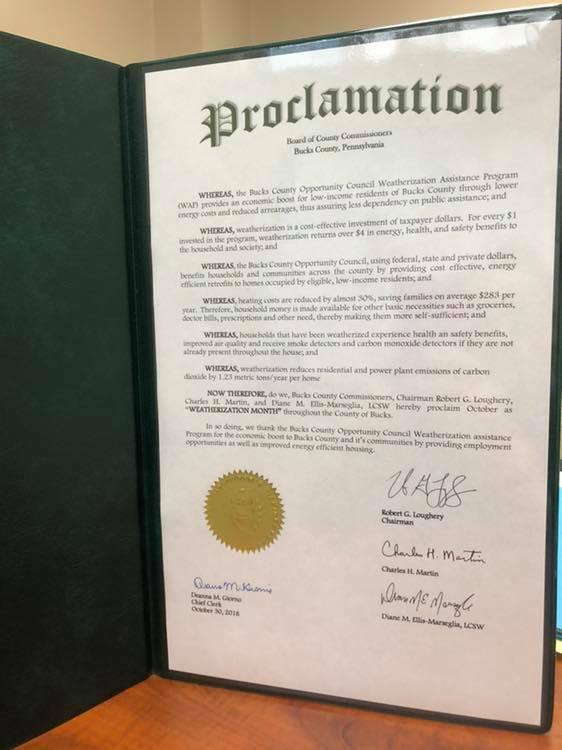 Additionally, Bucks County Pennsylvania also issued a proclamation. 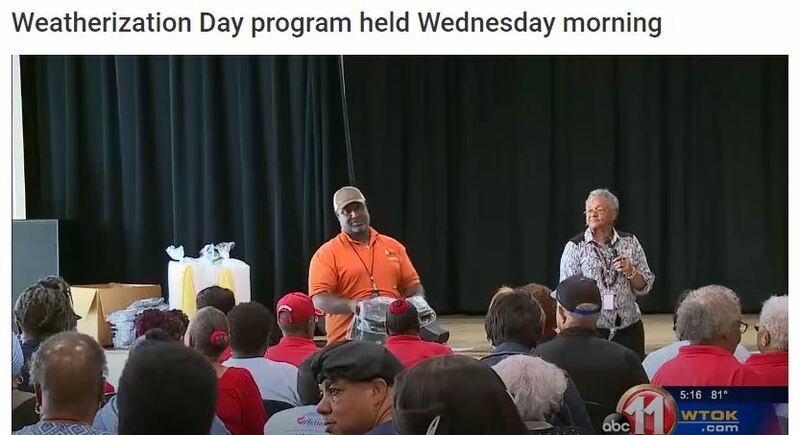 Events or other actions were held in 36 states: Alabama, California, Colorado, Delaware, District of Columbia, Florida, Georgia, Indiana, Iowa, Illinois, Kansas, Kentucky, Louisiana, Maine, Maryland, Massachusetts, Michigan, Minnesota, Mississippi, Missouri, Montana, Nebraska, New York, North Carolina, North Dakota, Ohio, Oregon, Pennsylvania, South Dakota, Tennessee, Texas, Utah, Virginia, Washington, West Virginia, and Wisconsin. 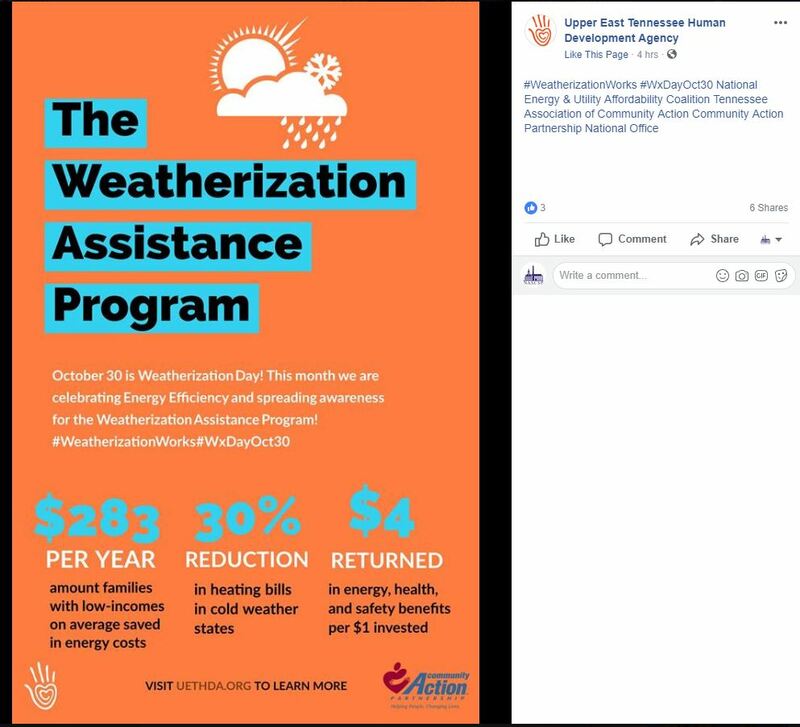 – The Community Action Partnership of North Alabama participated in a Weatherization Day Social Media Campaign by publishing the work done and money put into the program within the community. 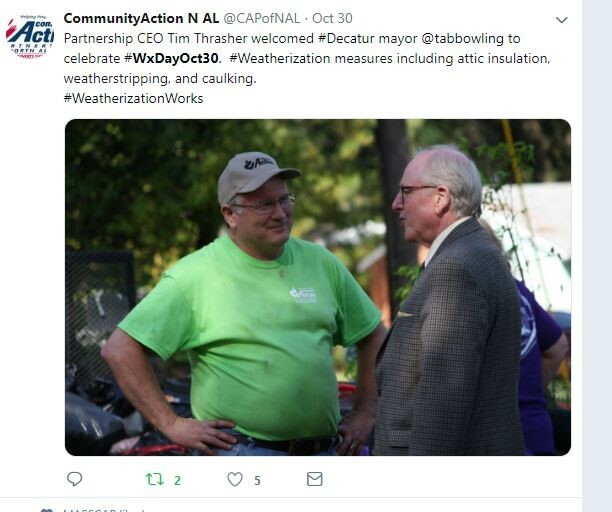 Community Action Partnership of Norther Alabama was also featured in a local news story titled “A Decatur woman is ready for winter after getting some help from the Community Action Partnership”. 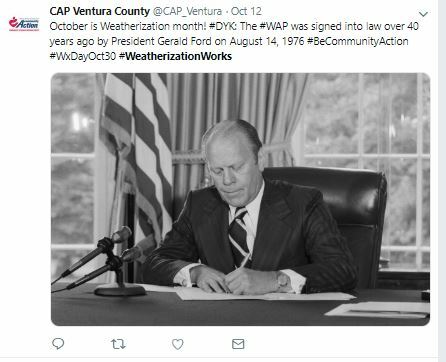 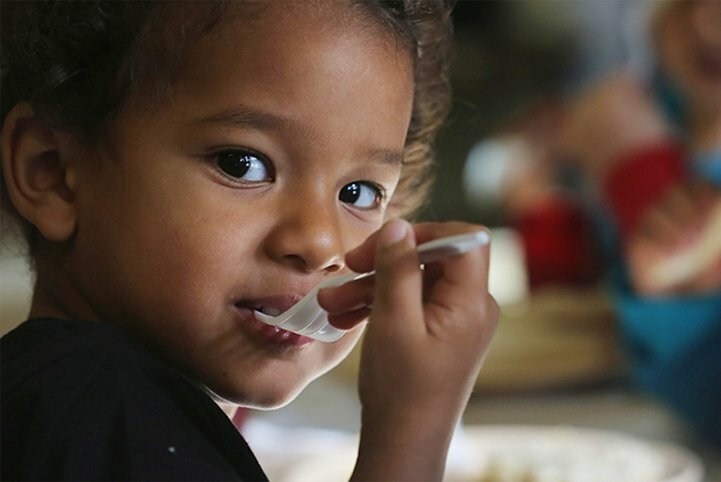 The Ventura County Community Action Agency used social media to issue DYK statements and statistics to increase awareness of the WAP Program over its more than 40 year history. 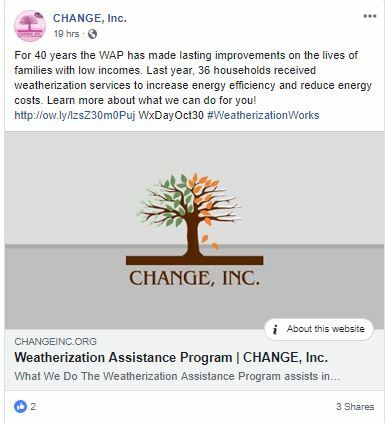 Community Action Partnership of Kern was also featured in a local news article. 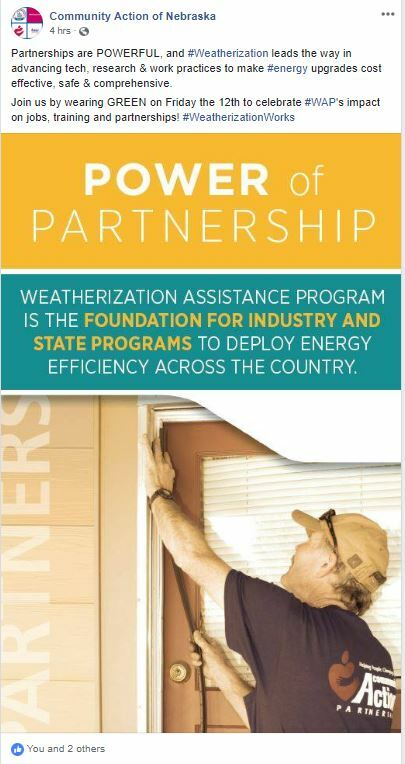 The Governor of Colorado issued a Proclamation for Weatherization Day. 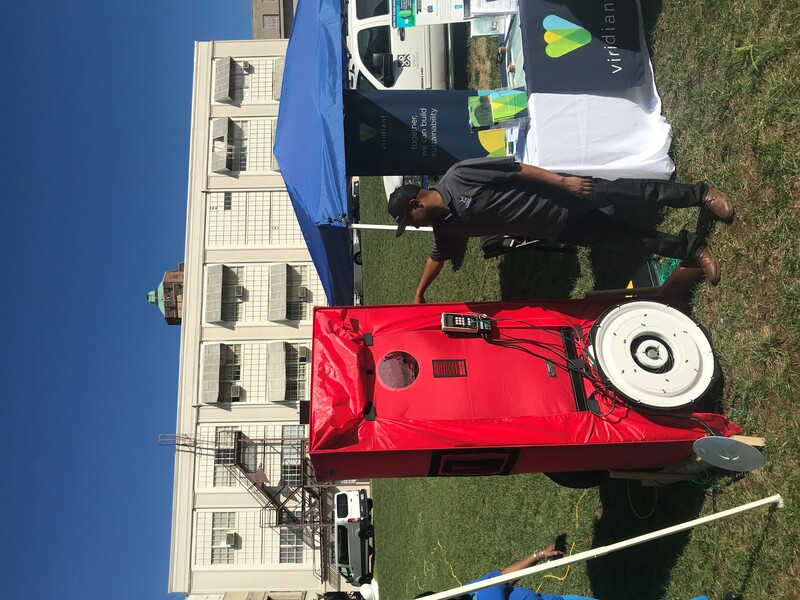 Additionally, Energy Outreach Colorado and the Colorado Energy Office partnered with NeighborWorks Southern Colorado, Pueblo County, and Lowe’s to hold a weatherization day event. 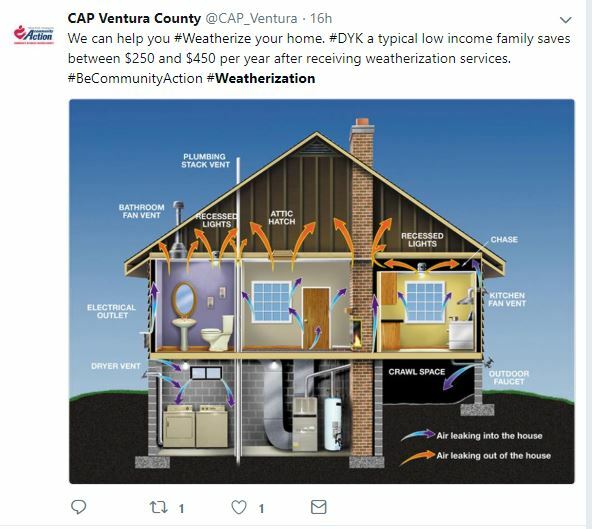 The Delaware Department of Natural Resources and Environmental Control (DNREC) issued a press release marking Weatherization Day. 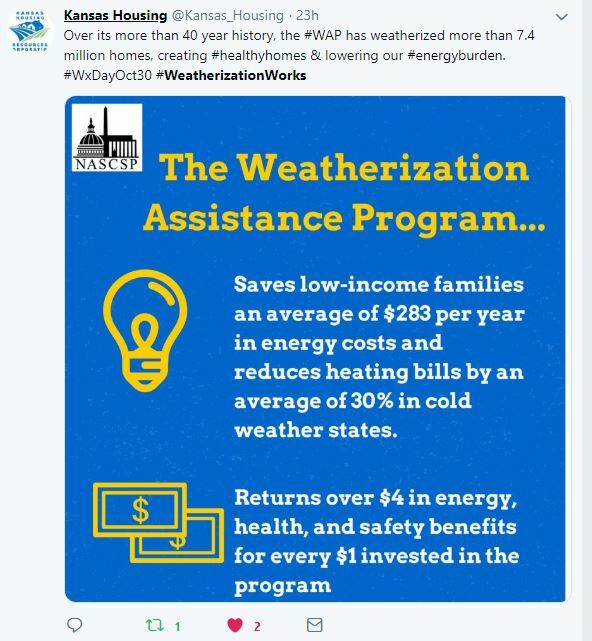 The Mayor of D.C. issues a Proclamation for Weatherization Day. 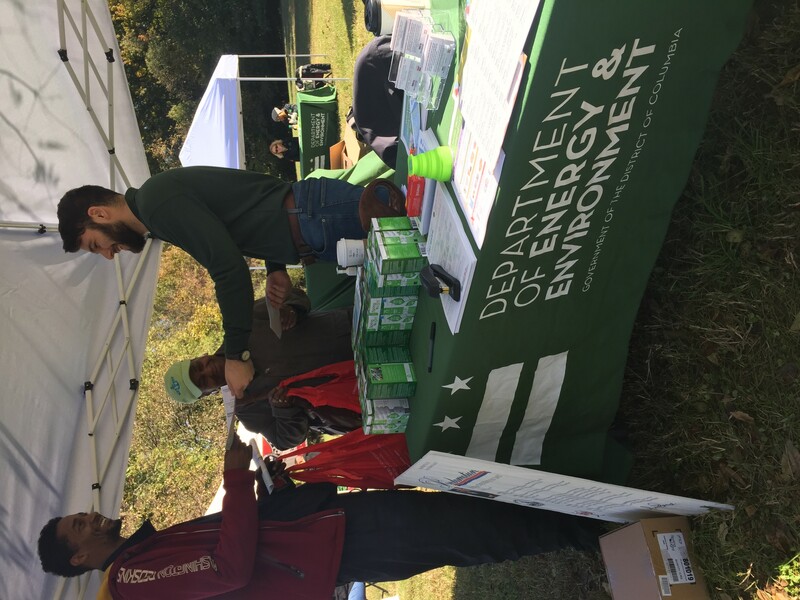 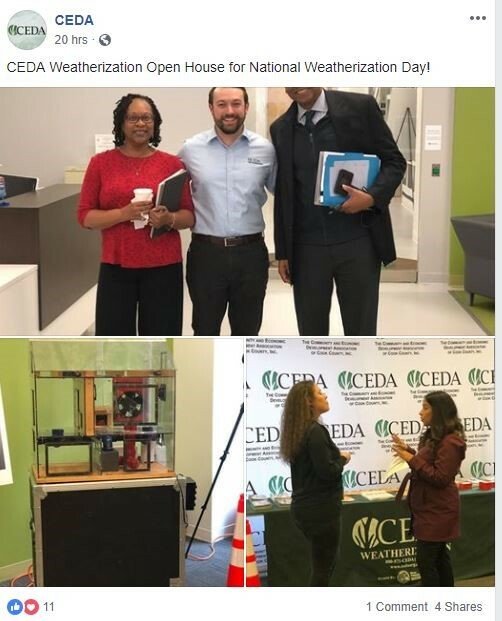 The D.C. Department of Energy and Environment also hosted a weatherization day event in the historic Anacostia neighborhood of DC. 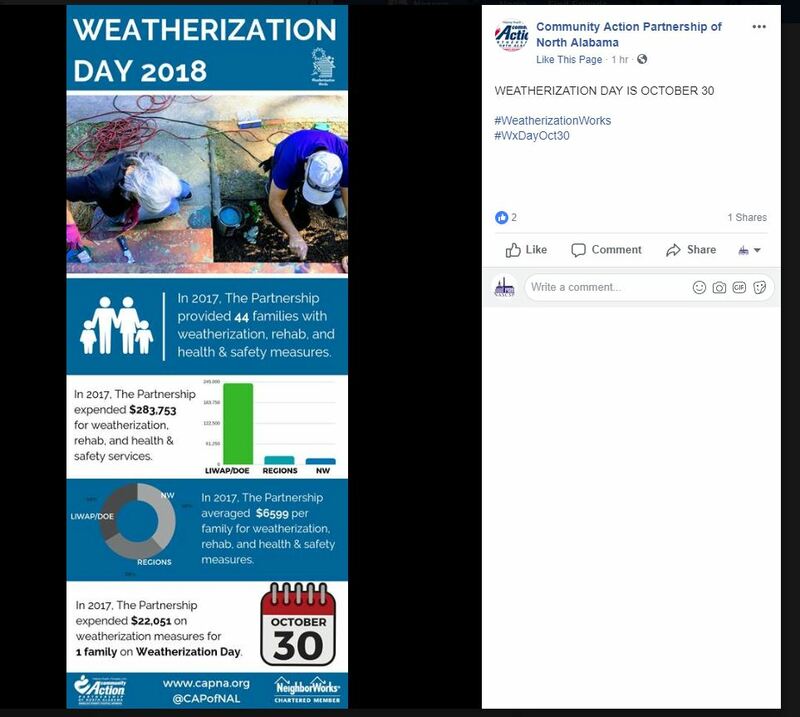 The Central Florida Community Action Agency participated in social media campaigns and highlighted their work with site visits. 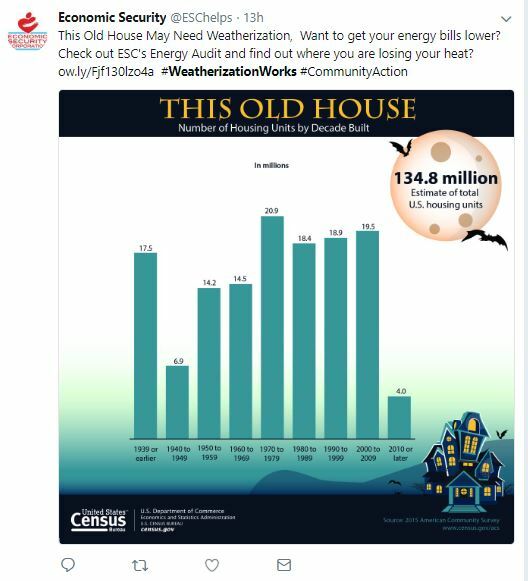 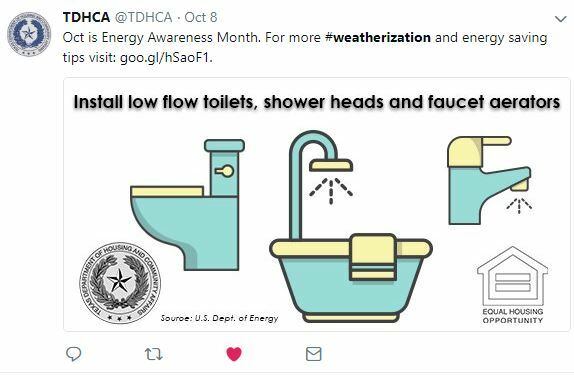 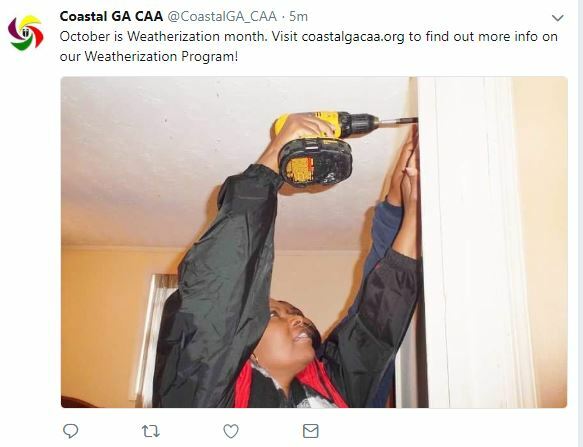 The Coastal Georgia CAA posted Weatherization facts and information through their social media accounts. 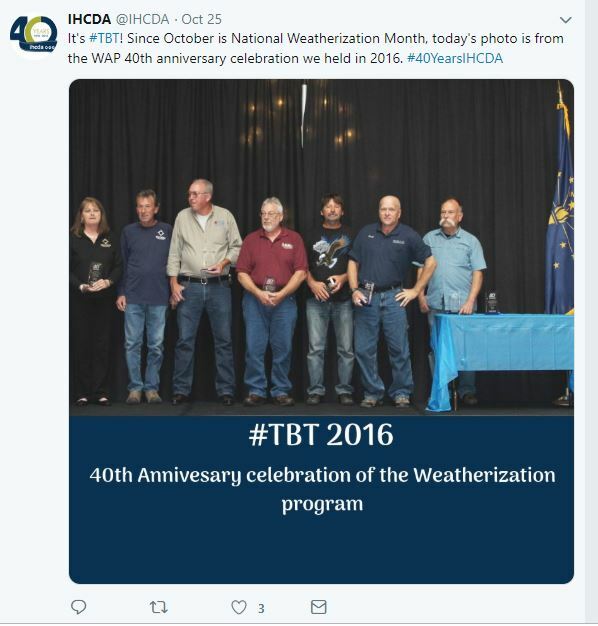 Indiana Housing and Community Development Authority, the State WAP grantee, recognized Weatherization Day on social media. 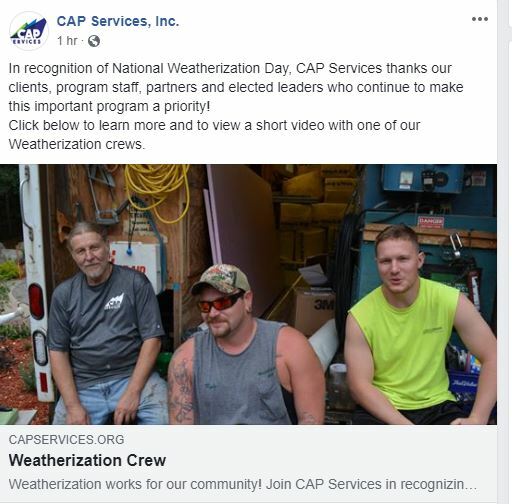 Tri-CAP used social media to show a video which highlighted WAP’s impact in the Community. 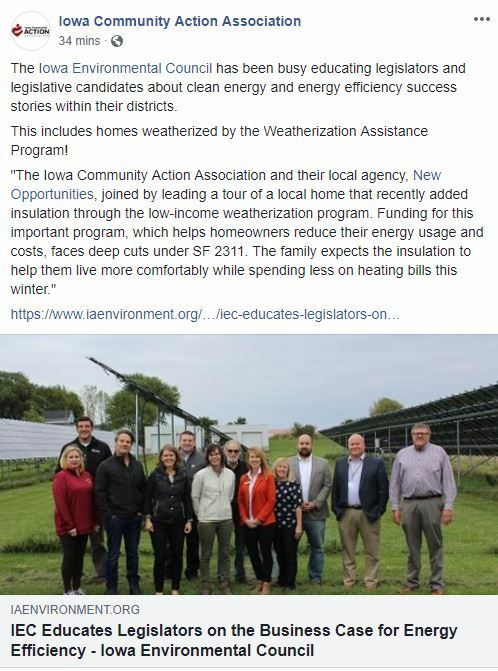 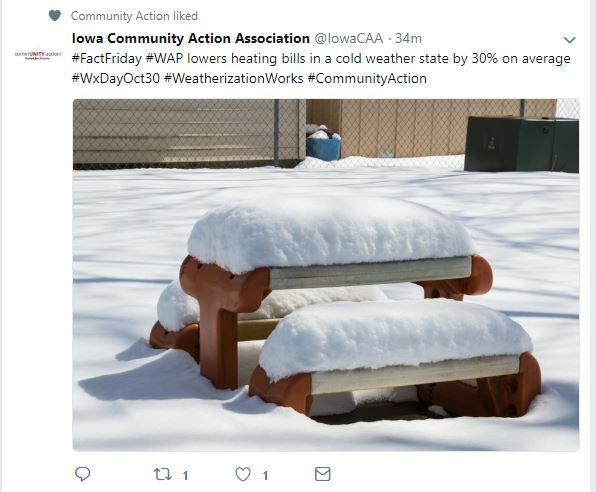 The Iowa Community Action Association led a social media campaign for Weatherization Day covering lowering energy bills, efficiency tours, and success stories. 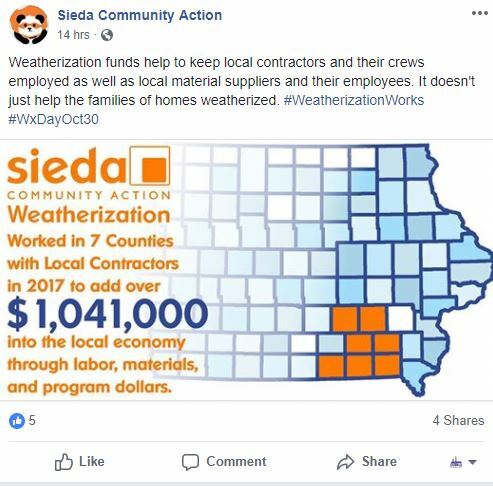 Sieda Community Action discussed their success and work done in their area through social media. 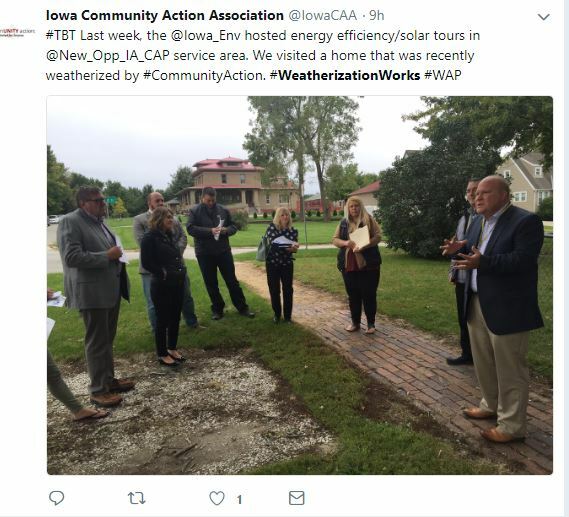 Iowa Community Action Association and a local agency, New Opportunities, also took two state legislators on site visits to homes undergoing weatherization. 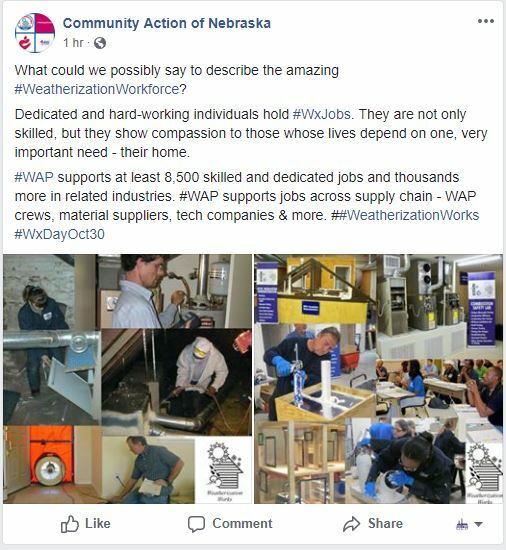 The Community and Economic Development Association issued statements and posts through social media highlighting Weatherization Day. 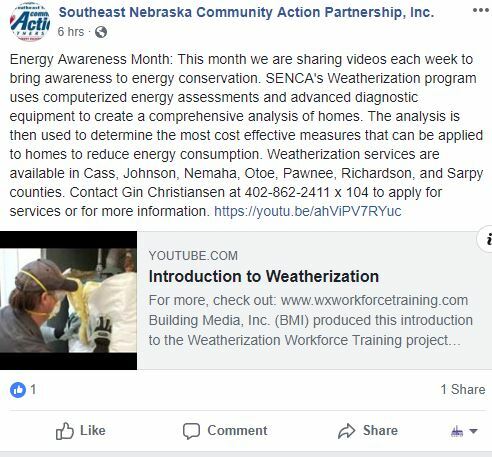 Kansas Housing discusses cost savings in relation to health and energy during the second week of weatherization month. 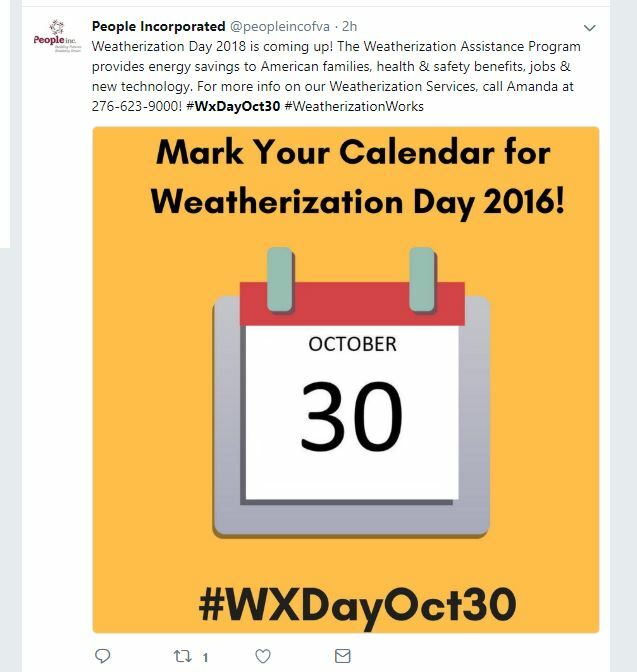 They also promoted WAP on social media and held a Weatherization Day expo. 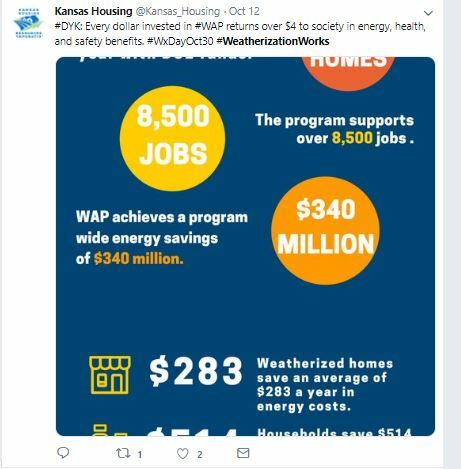 The governor of Kansas also issued a Proclamation for Weatherization Day 2018. 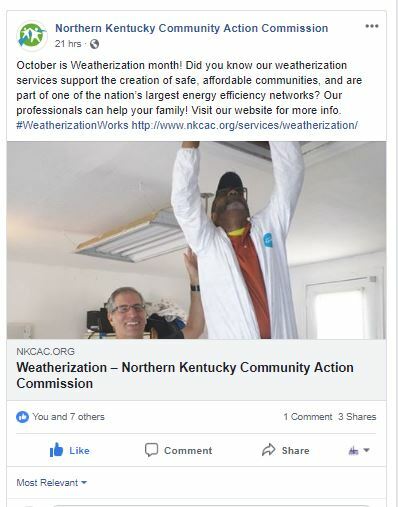 The Northern Kentucky Community Action Commission discussed the benefits of weatherization and highlighted their staff as a resource for information as well as energy, health, safety, and monetary benefits of the program. 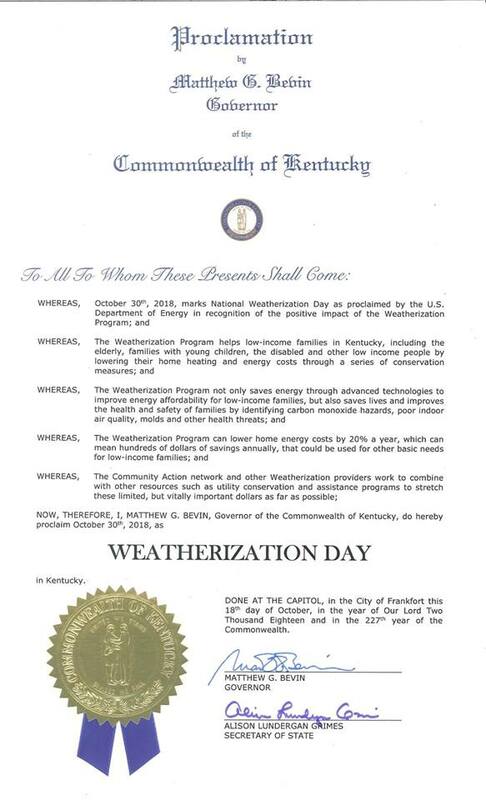 The Governor of Kentucky issued a Proclamation for Weatherization Day 2018. 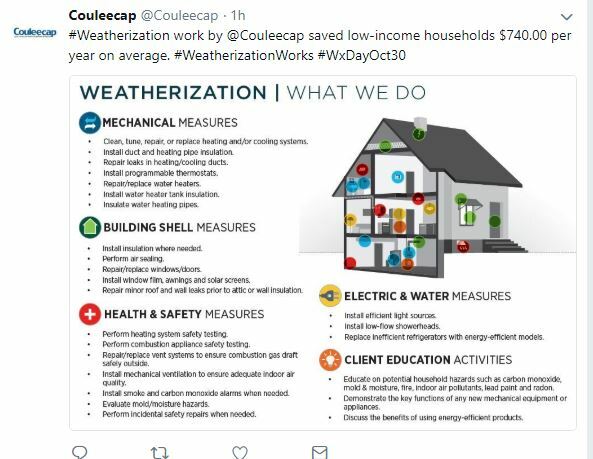 The Governor of Louisiana issued a Proclamation for Weatherization Day 2018. 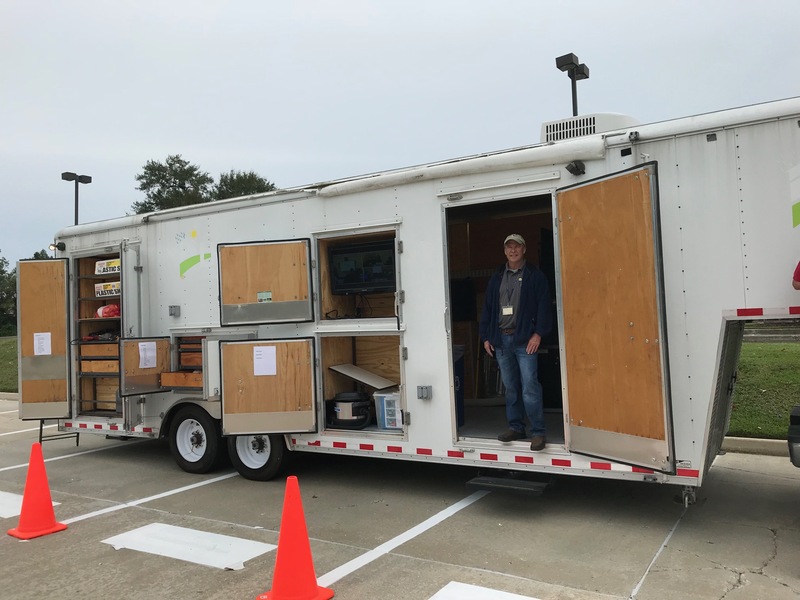 Louisiana Housing Corporation, the State WAP Grantee, also held a Weatherization Day event highlighting the program and weatherization technology. 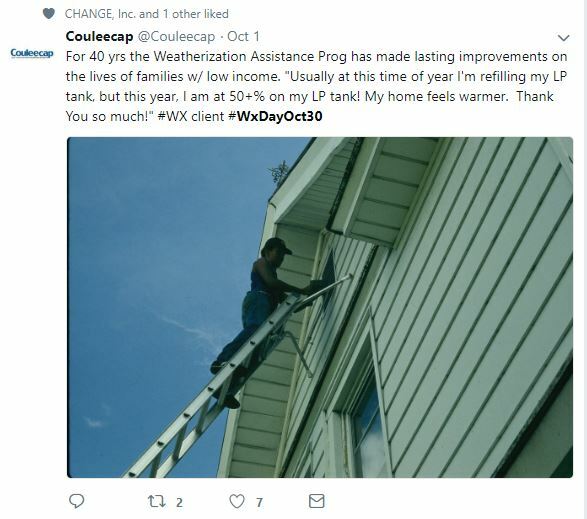 Maine State Housing Authority, the State WAP grantee, celebrates leading up to weatherization day. 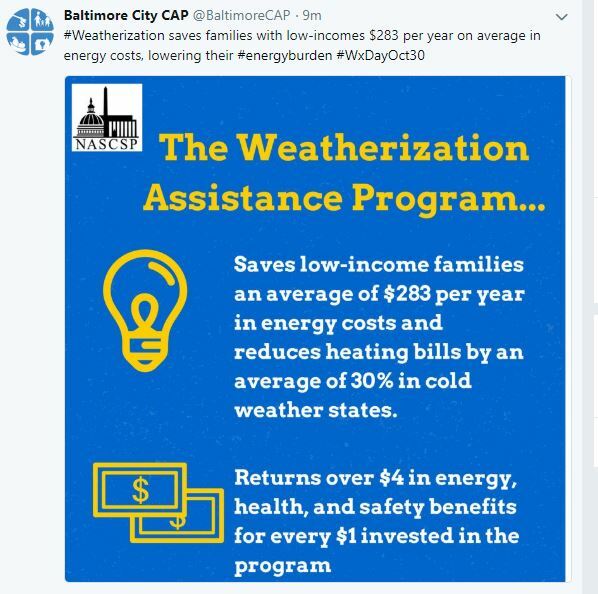 The Baltimore City CAP participated in a Weatherization Social Media Campaign as well as site demonstrations in order to increase awareness for the Weatherization Assistance Program. 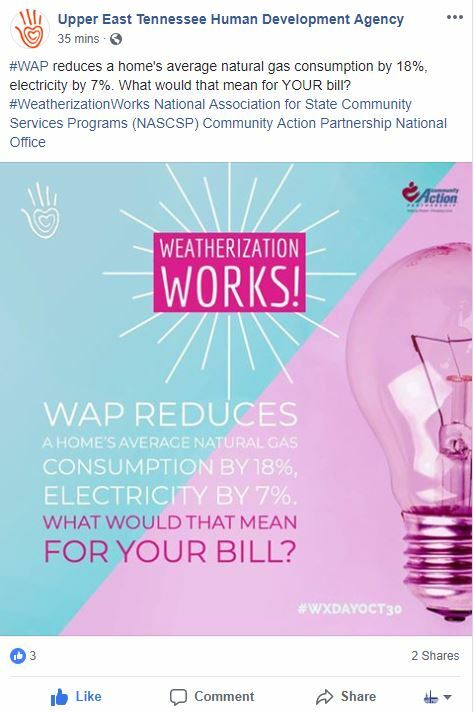 Even the Montgomery County Division of Solid Waste issued a statement on the health and environmental benefits of the WAP Program. 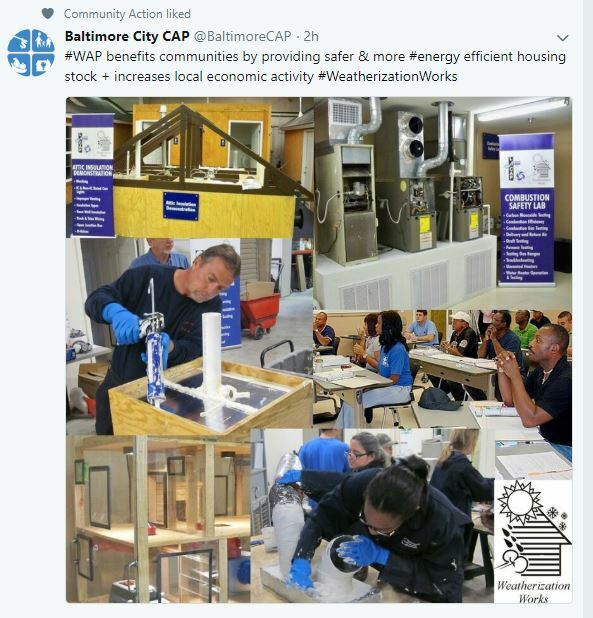 Community Teamwork shares some of what the WAP Program has done its in 40+ year history. 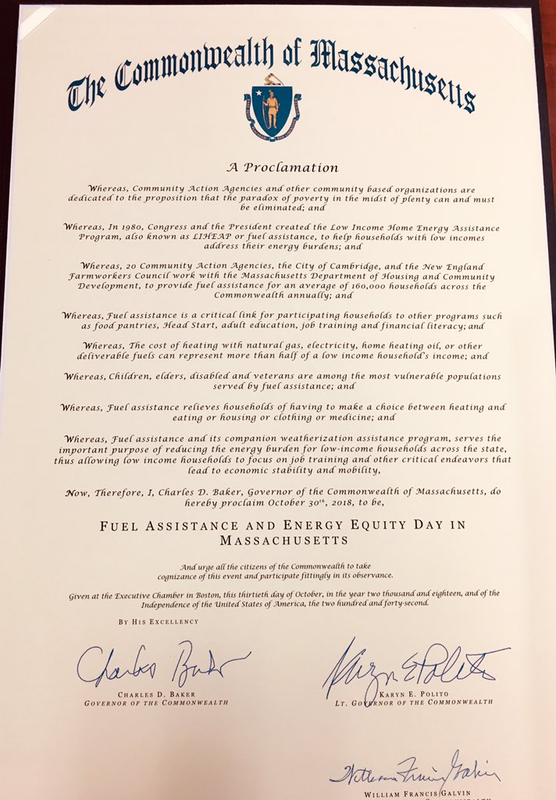 Additionally, the governor proclaimed October 30th Fuel Assistance and Energy Equity Day. 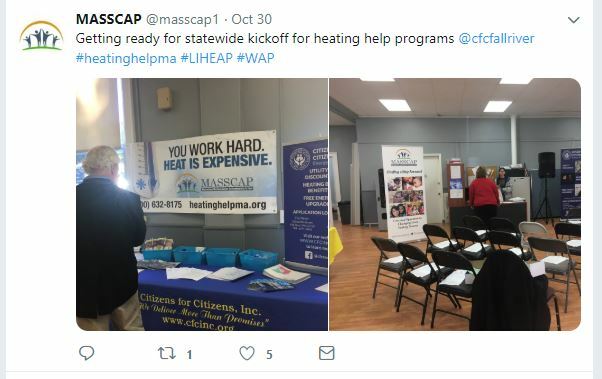 MassCAP also held an event on October 30th to kick off both LIHEAP and WAP for the year. 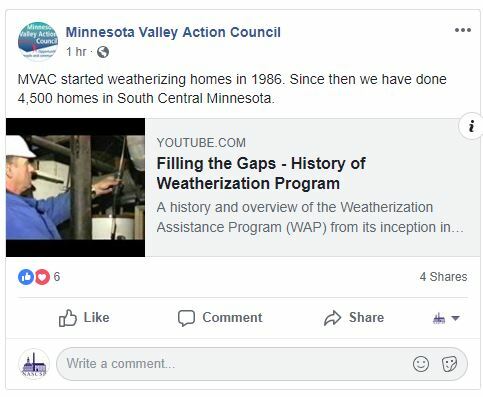 The Minnesota Valley Action Council used social media to send out a brief history of the WAP Program to educate those unfamiliar with WAP and to increase awareness of its importance. 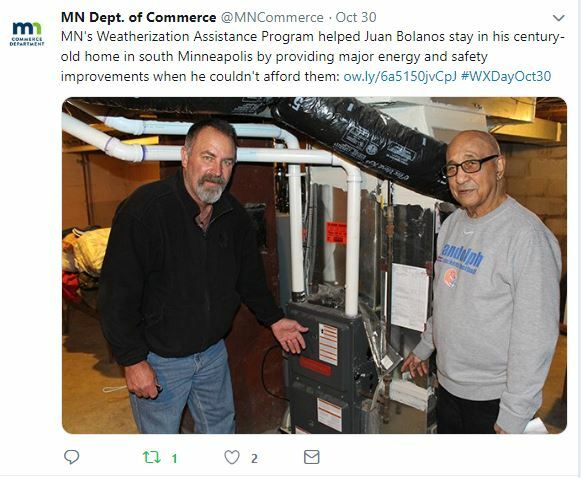 Minnesota Department of Commerce, the State WAP grantee, also highlighted success stories on social media. 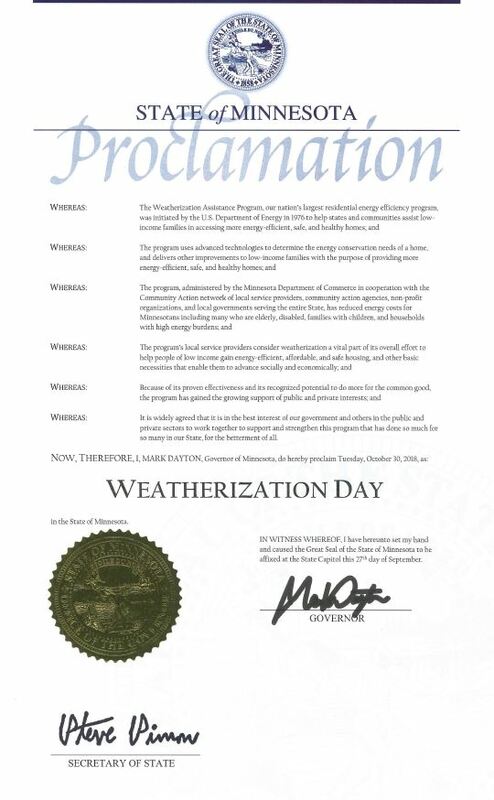 The Governor of Minnesota issued a Proclamation for Weatherization Day 2018. 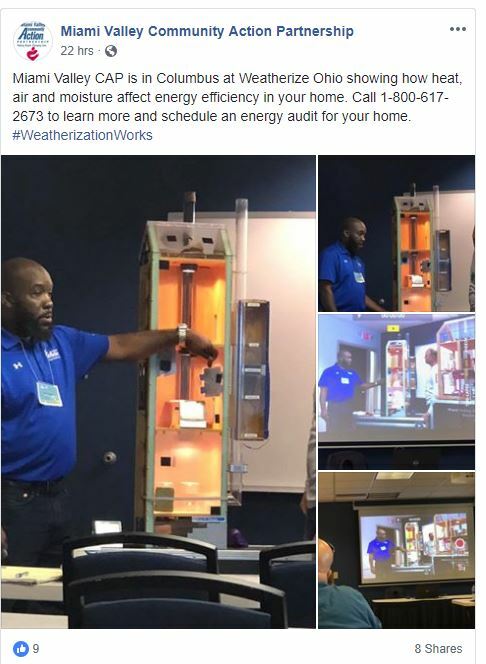 The Multi-County Community Service Agency held a Weatherization Day information session that was covered in a local news story. 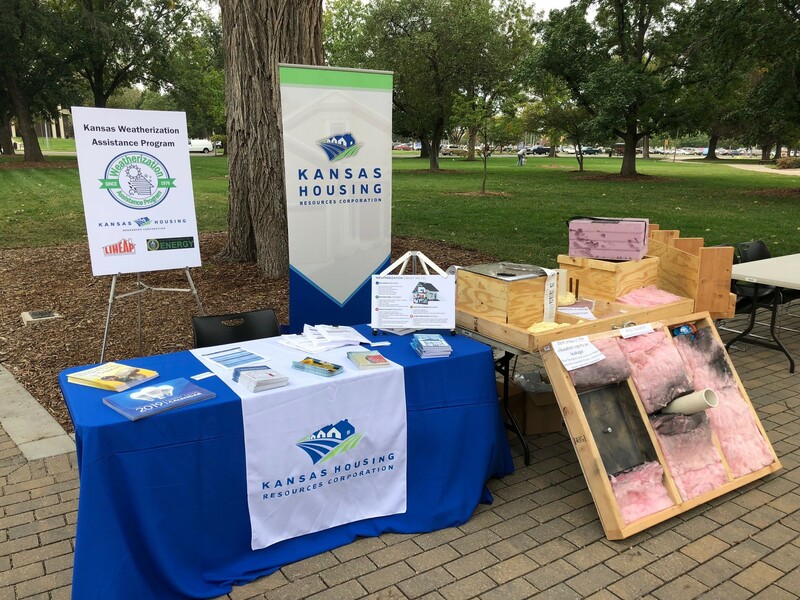 The Economic Security Corporation of the Southwest Area celebrated WAP and Weatherization Day by highlighting discussing cost statistics and weatherization’s impact using “This Old House” and promoting an event. 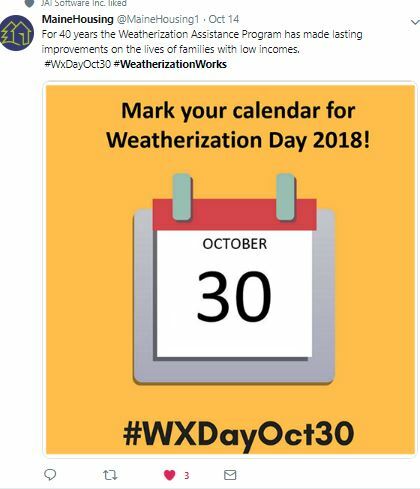 The Governor of Missouri also issued a Proclamation for Weatherization Day 2018. 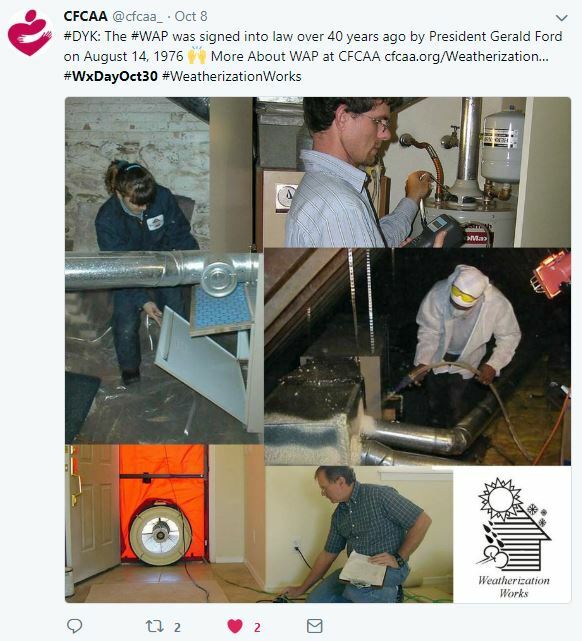 OACAC held a Q & A session with their WAP technicians for Weatherization Day. 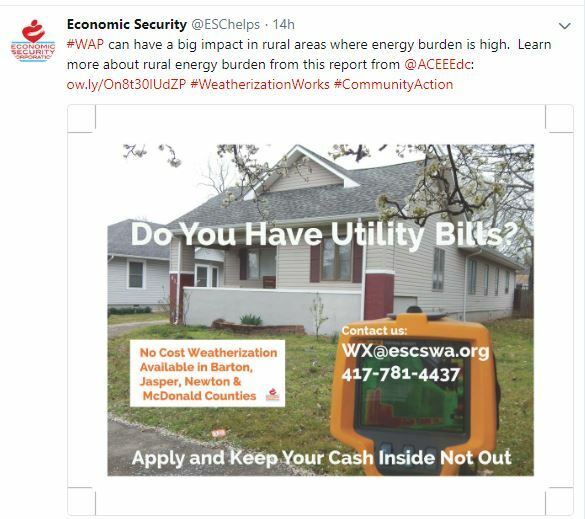 Economic Security Corporation (ESC), NECAC, and East Missouri Action Agency (EMAA) were all featured in a local news articles. 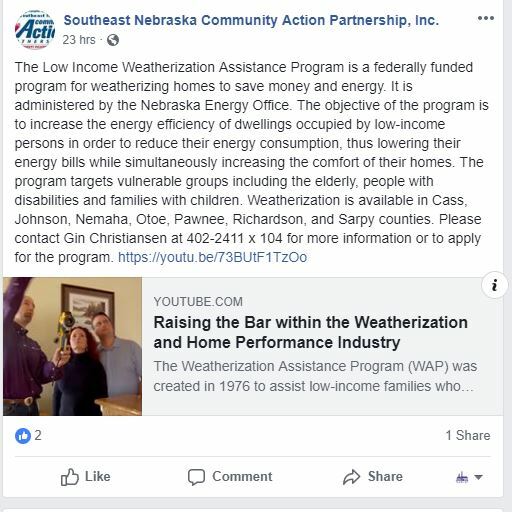 The Montana WAP and local agency Human Resource Development Council (HRDC) was featured on a local news program. 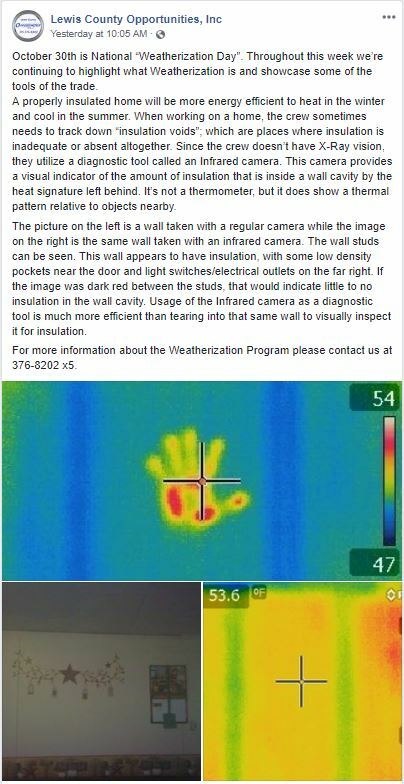 Lewis County Opportunities Inc. shows off some of the tools of the trade with infrared. 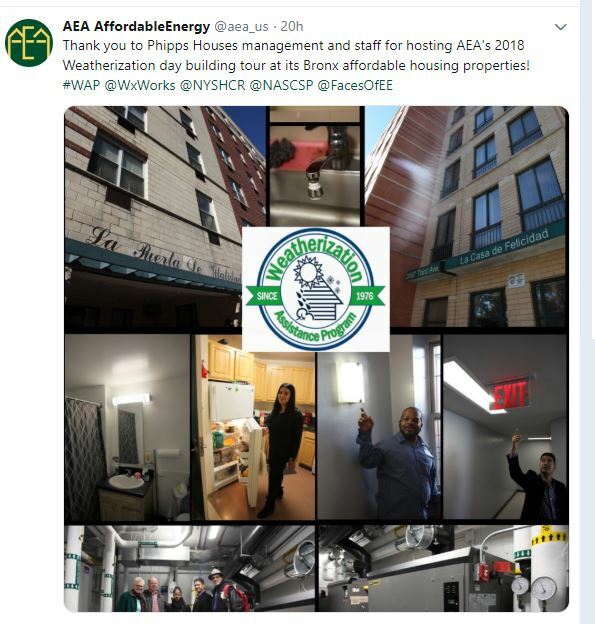 The Association for Affordable Energy held a tour of a multifamily building undergoing weatherization on Weatherization Day. 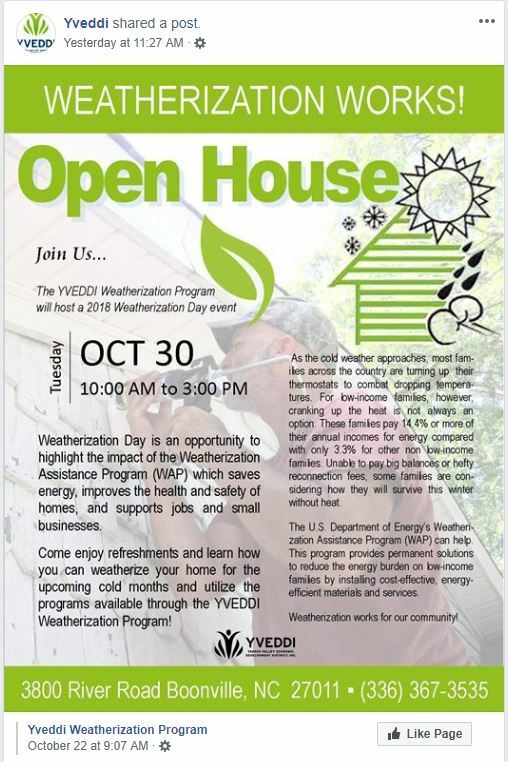 Tioga Opportunities, Inc. also held a Weatherization Day open house which was featured in a local news story. 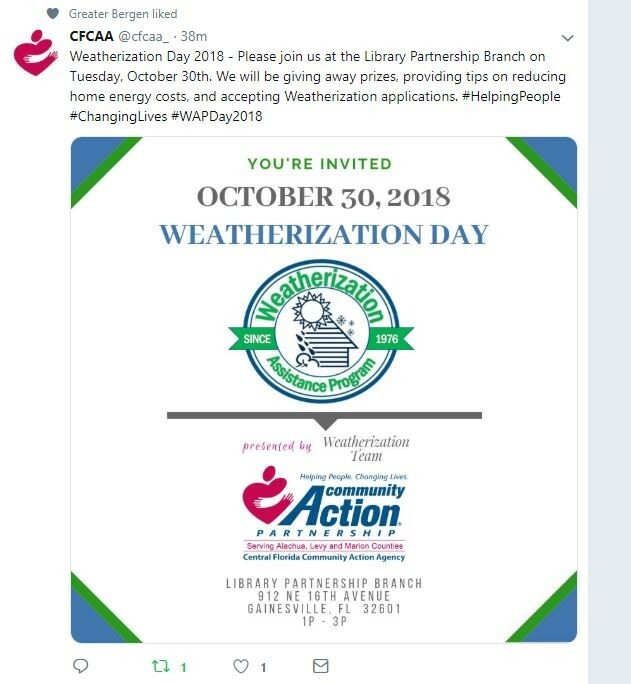 YVEDDI and Central Piedmont Community Action (CPCA) both held Weatherization Day events to promote the program in the community. 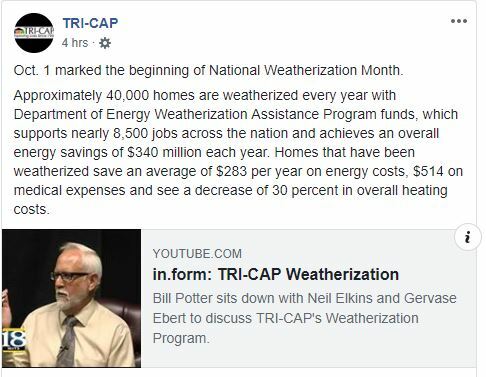 The CPCA event was covered in a local news story. 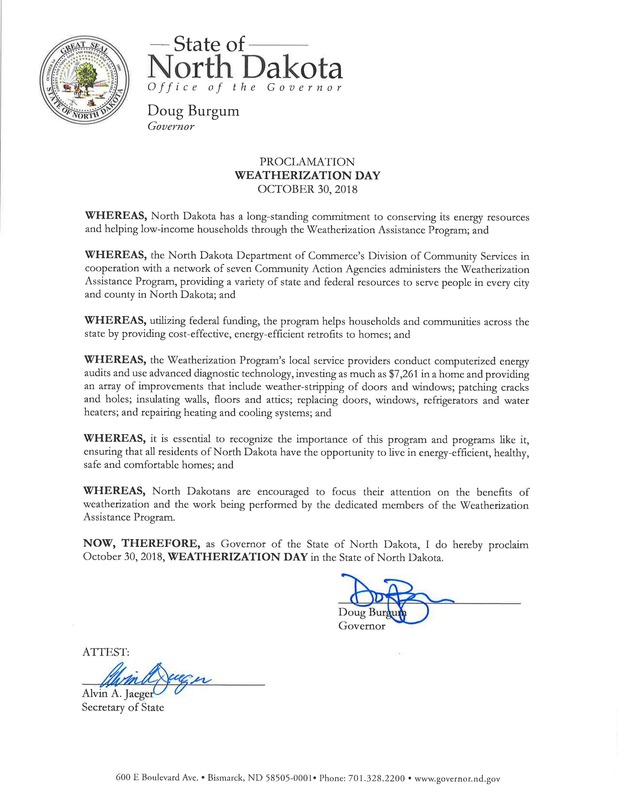 Governor Doug Burgum issued a Weatherization Day proclamation. 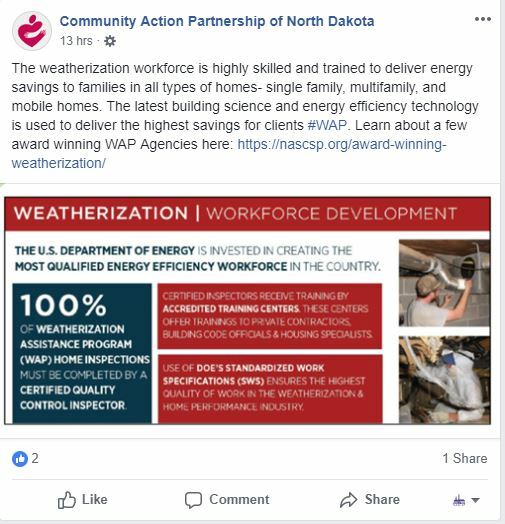 The Community Action Partnership of North Dakota discusses the qualification of the WAP Workforce and the industry’s technology. 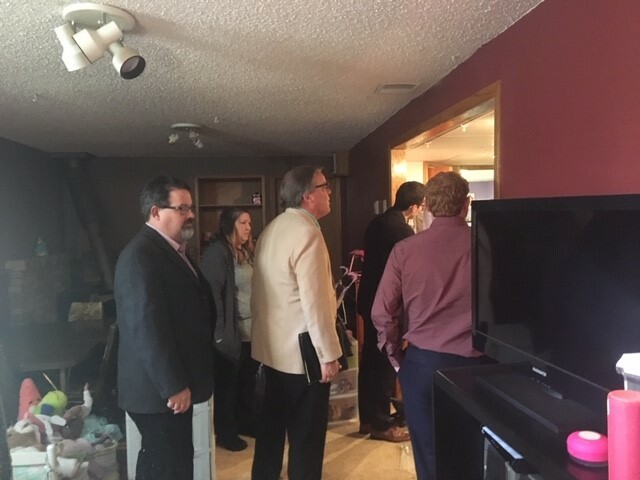 The North Dakota Department of Commerce, the State WAP Grantee, partnered with the Community Action Partnership of North Dakota to hold a Weatherization Day site visit that was attended by members of Senator Heidkamp, Senator Hoeven, and Congressman Cramer. 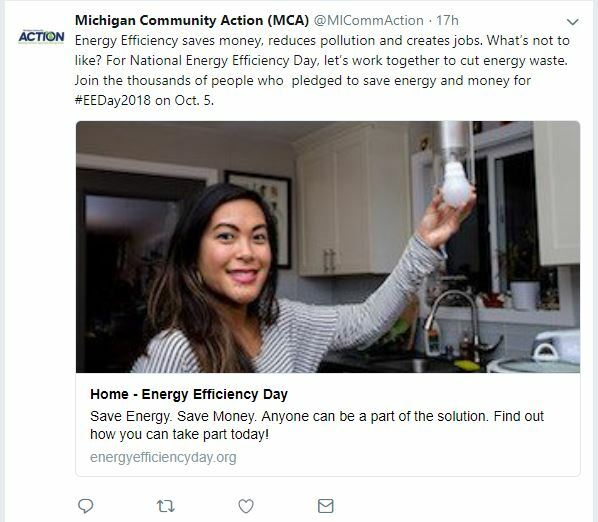 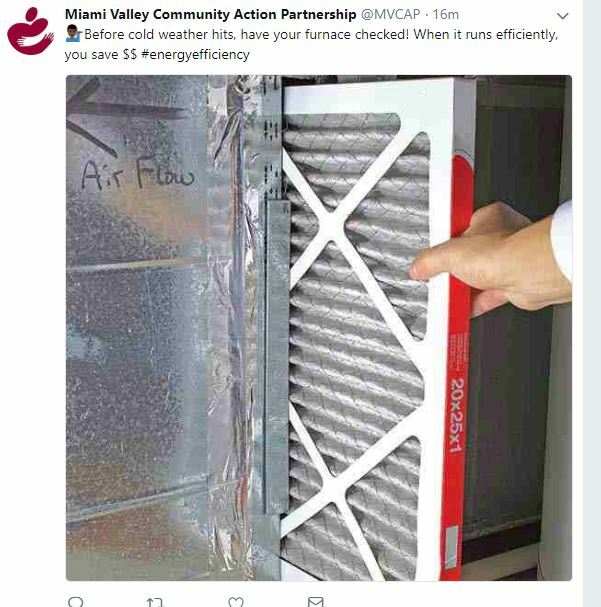 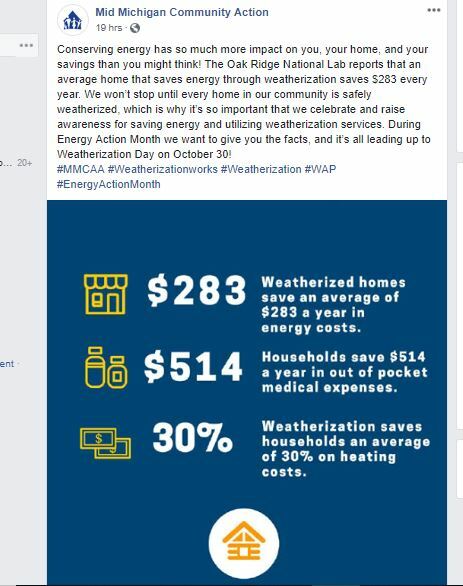 The Miami Valley CAP publishes PSA’s about home energy efficiency measure and advertises some of their Weatherization Day events. 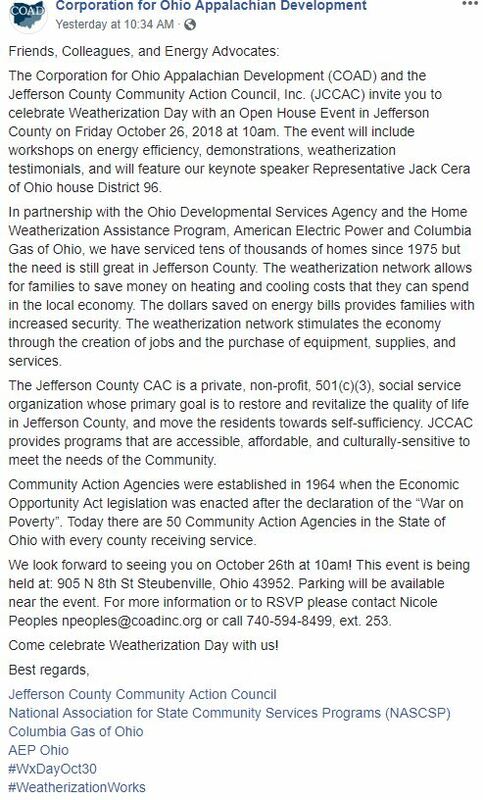 The Corporation for Ohio Appalachian Development issued an invitation to a WAP Open House for people to learn more about the program and to answer any questions. 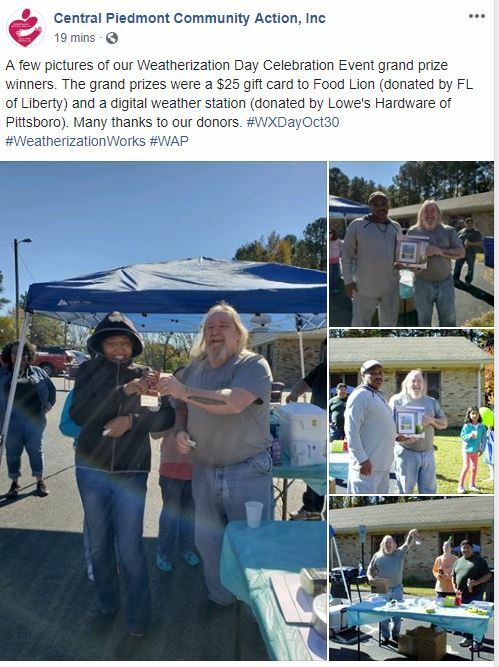 The event was featured in a local news story. 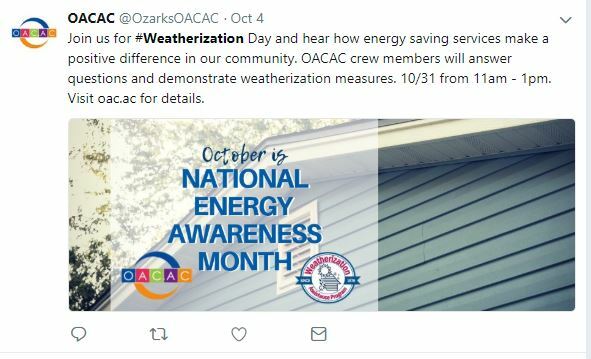 OACAC put on a Q&A with their crews to answer any questions the public may have. 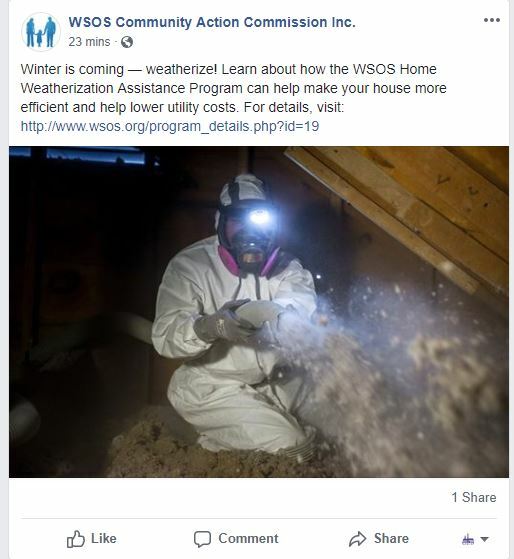 WSOS promotes weatherization programs in terms of efficiency and utility costs as winter approaches. 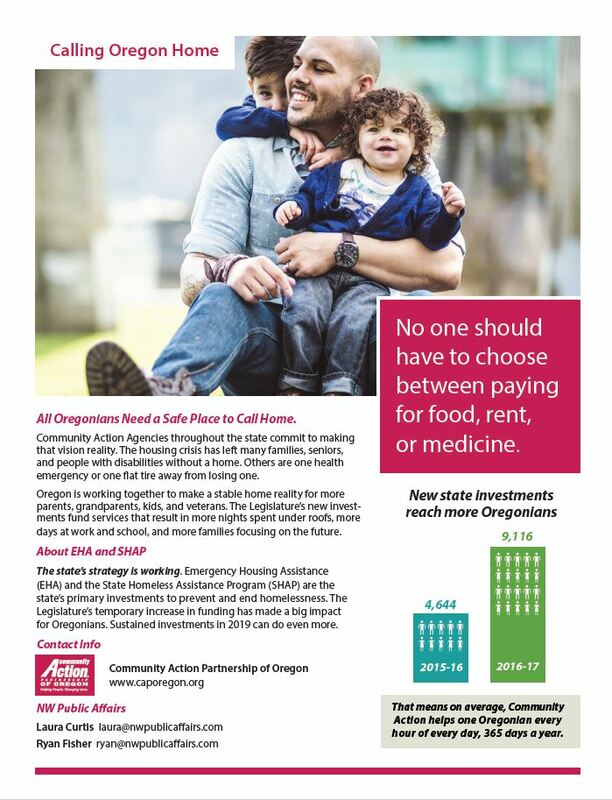 The Community Action Partnership of Oregon issued publications on the necessity of housing investment in order to fight homelessness. 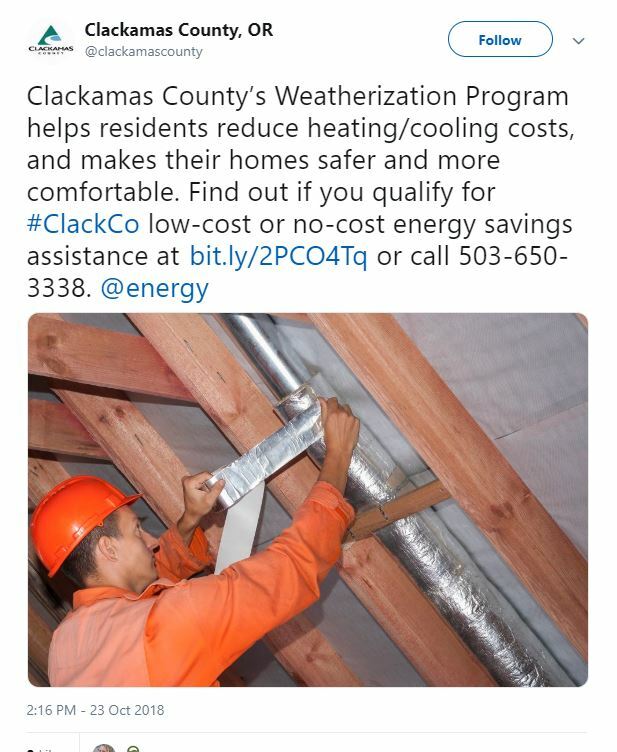 Clackamas Count, OR shows of its WAP Program with some examples of work being done. 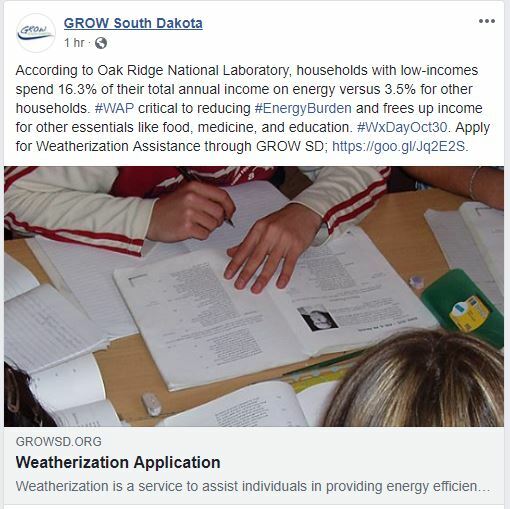 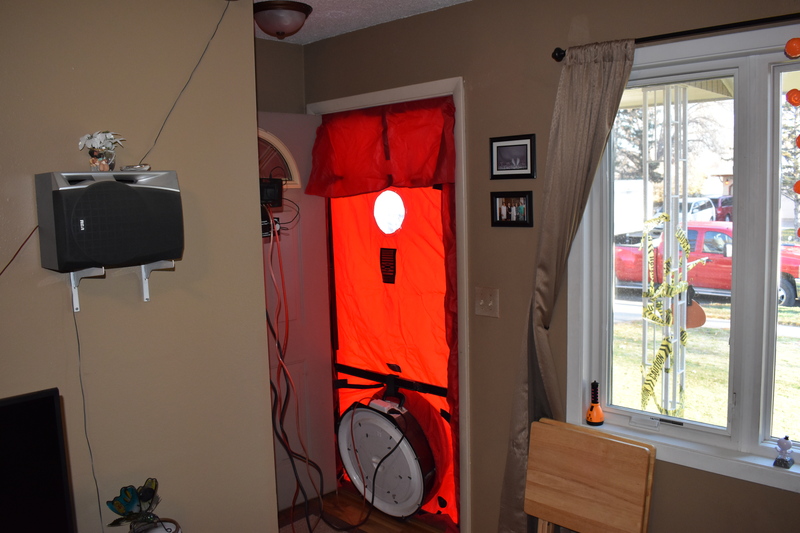 GROW South Dakota highlights their highly trained workforce, who are proficient in the latest weatherization technology. 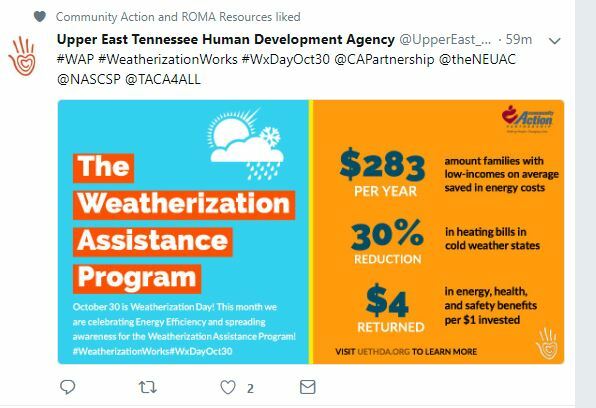 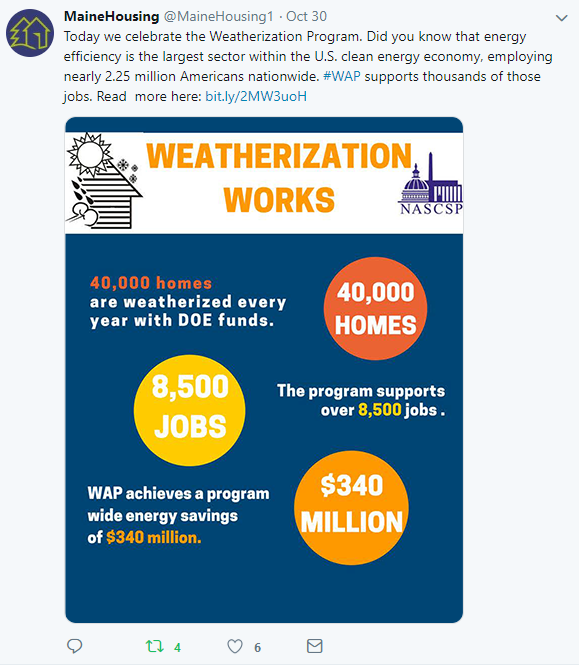 The Upper East Tennessee Human Development Agency published statistics and other awareness campaigns via social media for Weatherization Day through utilities and cost savings. 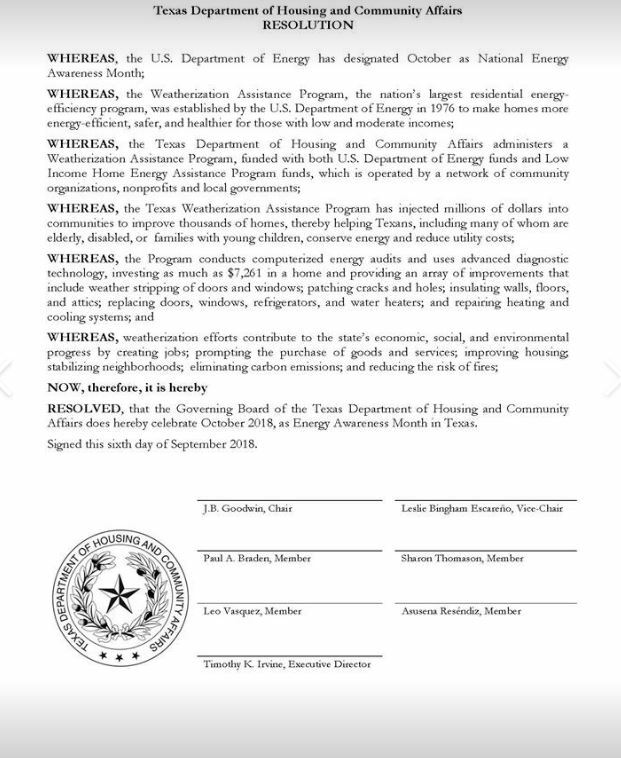 Texas Department of Housing and Community Affairs issued a resolution declaring October 2018, Energy Efficiency Awareness month in Texas as well as highlighting steps one can take to be more energy efficient and promoting a success story. 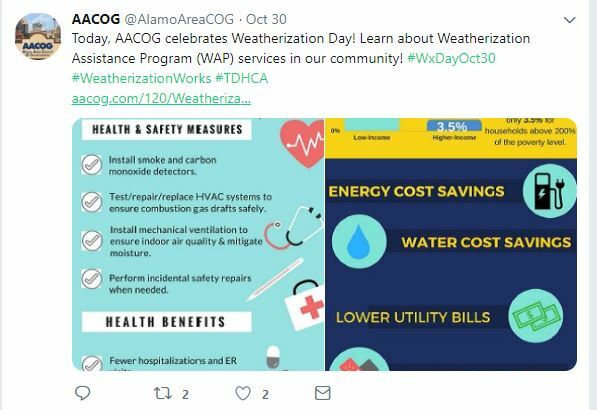 The Alamo Area Council of Governments (AACOG) also engaged on social media and held a Weatherization Day luncheon recognizing their weatherization crew members. 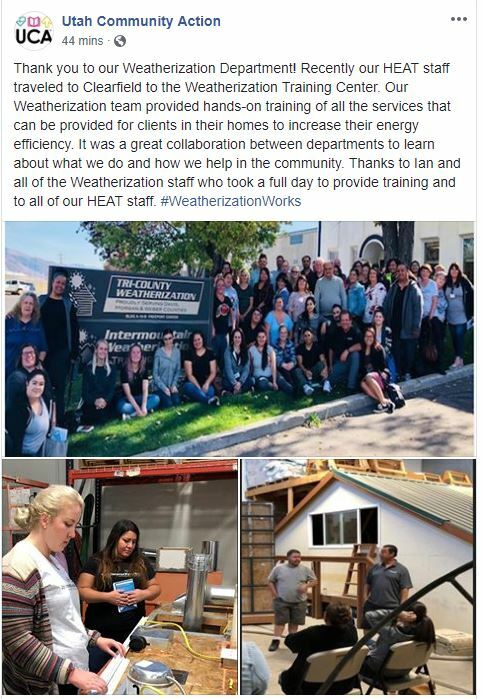 Utah Community Action and the Utah Weatherization Training Center partnered together to host a Weatherization Day training event. 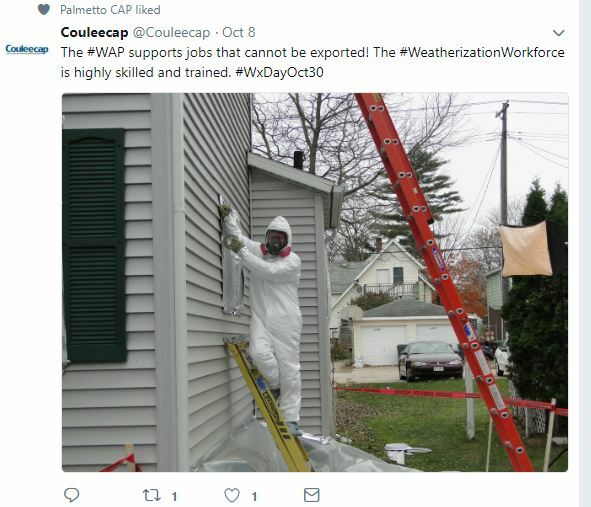 People, Inc., a CAA in Virginia, highlighted Weatherization Day and the WAP Program on their social media account. 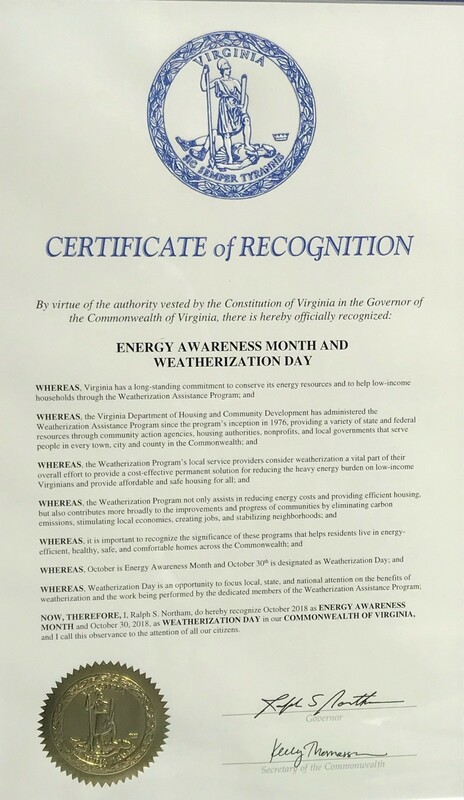 The Governor of Virginia issued a Proclamation declaring October Weatherization Month. 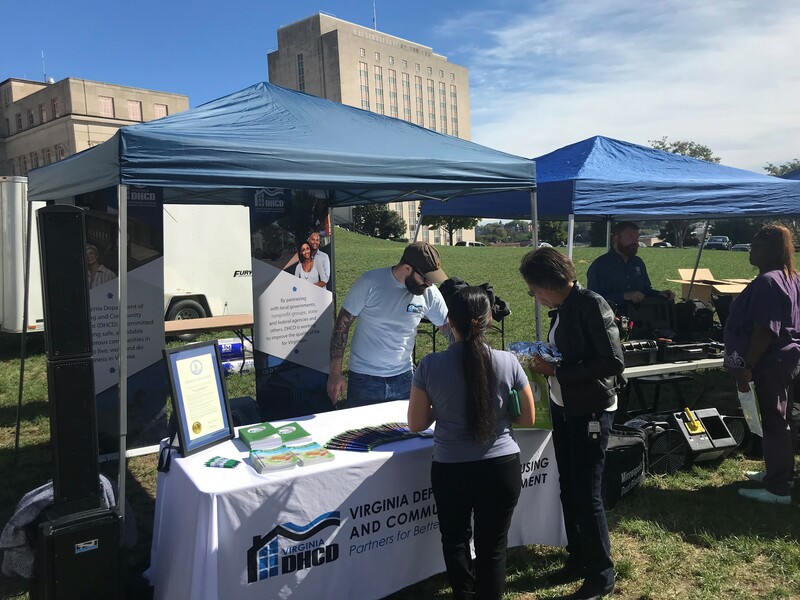 The Virginia Department of Housing and Community Development, the State WAP Grantee, also held a Weatherization Day expo with technology demonstrations and booths from community partners. 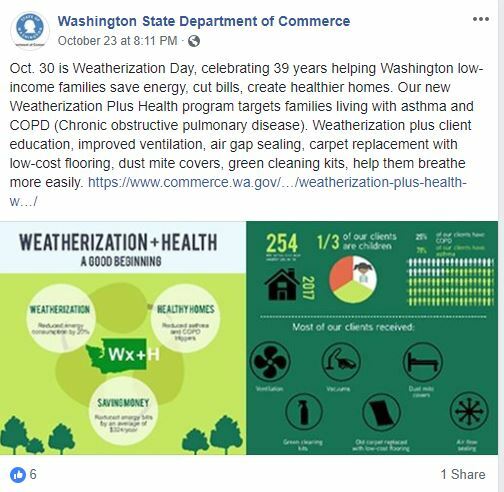 Washington State Department of Commerce issued statistics and stories about their state WAP Program’s success and operations. 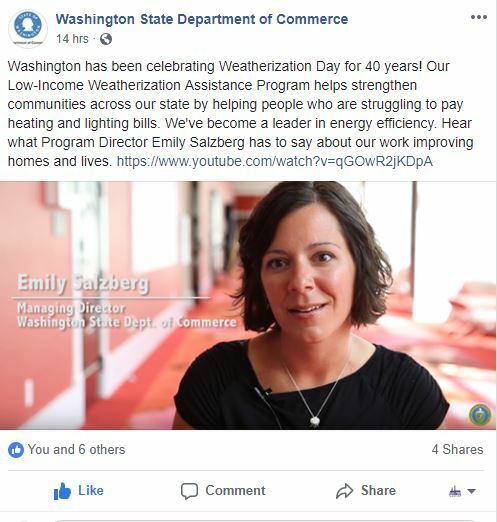 The Washington Department of Commerce also shared a message from their Program Director, Emily Salzberg on the Program. 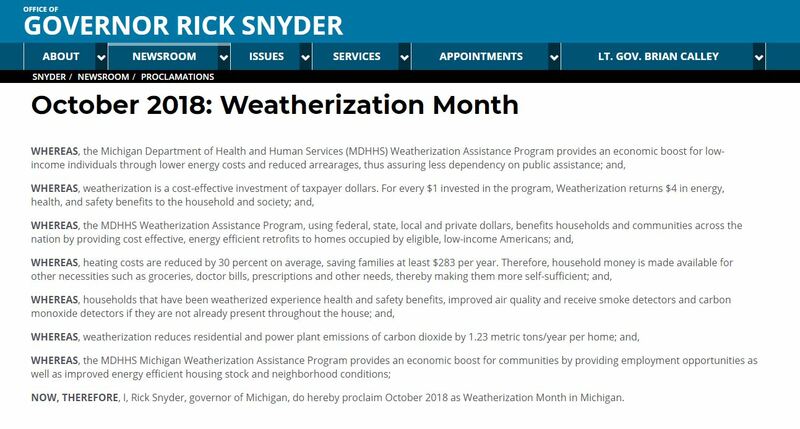 The Governor of Washington issues a Proclamation declaring October Weatherization Month. 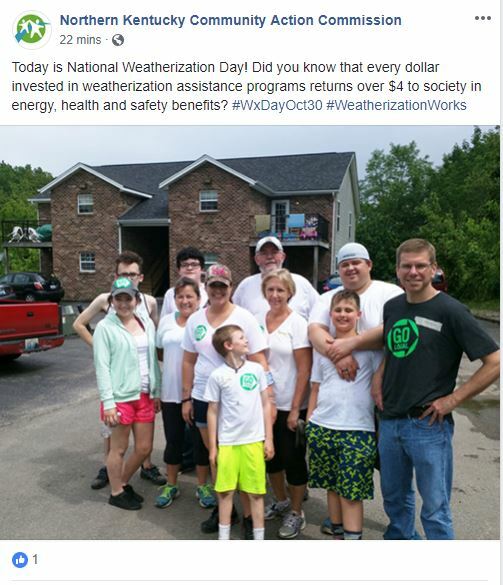 CHANGE, Inc. of West Virginia weatherized 36 homes through your Weatherization Assistance Program and highlighted it through social media. 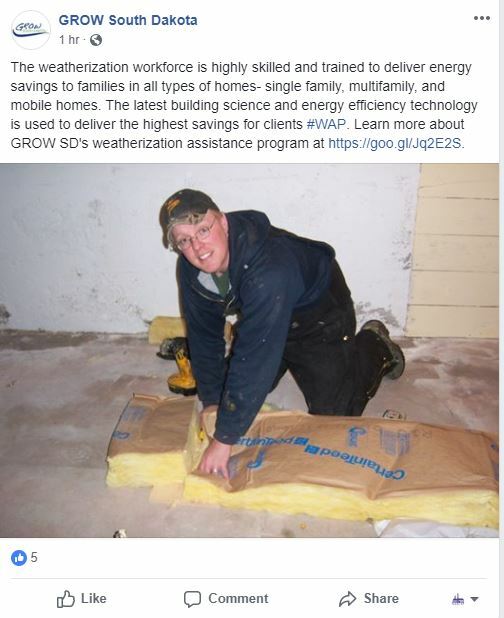 Coulee CAP of Wisconsin demonstrated the WAP Program through publishing facts and statistics and engaging in site demonstrations, which they show off on social media. 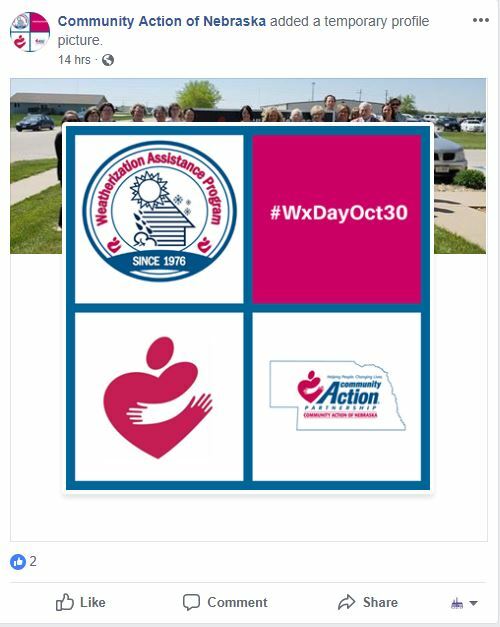 Additionally, they show the human side to WAP by highlighting members of their team!